The Classic ST has the same premium quality technology as the WINTERSTEIGER Classic. The changeable concaves, shakers and cleaning sieves support eployment with any threshable crop. 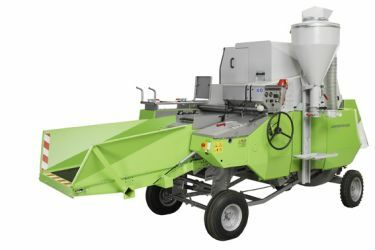 Pneumatic seed delivery and the plot clean out system guarantee mix-free threshing and fast clean out of the combine. As it is mounted on a trailer chassis with generously dimensioned tires and drum brakes, the combine can be easily transported between locations. The machine is fed by means of a long or short in-feed table with conveyor belt to upport a constant flow of material to the threshing drum. The combine is driven ither by a diesel engine or by an electric motor and is thus suitable for uses in losed rooms. Alternatively, the electrical version can be powered by a PTOdriven generator.